Being the famous golf blogger that I am, I was recently contacted by Club Champion to check out their Chicago/River North location and to go through a total bag fitting. 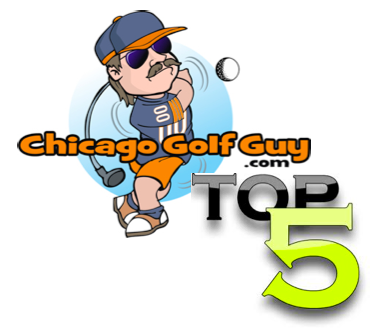 The Chicago Golf Guy does not give out a lot of advice, but when a company like Club Champion invites you to blog about their services, you jump at the chance. I visited Club Champion on Ohio street downtown Chicago. The space is located on the second floor of a loft building. There is convenient parking right next door. You have to leave your keys with the attendant, and you need to pay cash. Club Champion can validate your parking for a reasonable $5, but the attendant cannot run your card for less than $12 (the standard price), so please bring cash to pay for parking or else you are going to shell out $12 instead of $5. The space itself is beautiful, hard wood floors, a great leather seating area complete with big screen TV and plenty of golf magazines. 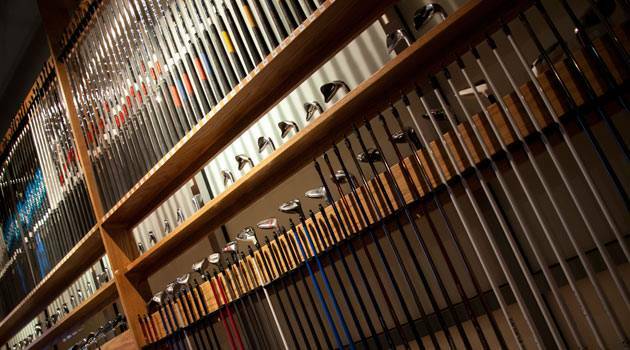 Club Champion spared no expense when they built out their flagship store in Chicago. I was impressed from the very moment I walked in the door. I met my club fitter Mike outside (as I was the first appointment for the day) and we walked up together. After our introductions, and me putting on my golf shoes, we walked over to the hitting areas. 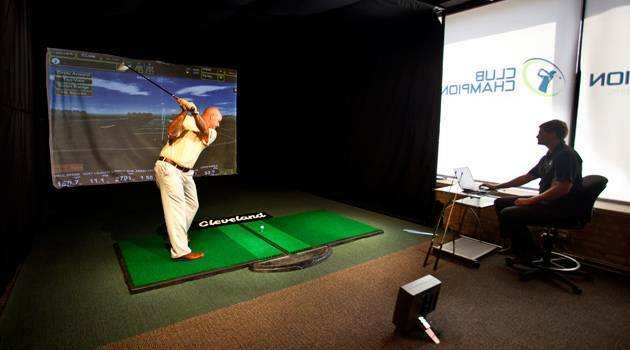 The hitting bays are equipped with state of the art Trackman launch monitors and software. The Trackman software is what allows the technician to know your spin rate, launch angle, swing speed, ball speed, smash factor and a host of other items that I do not fully understand (but my technician did). After I was warmed up he asked me to hit six balls with my own six iron, to get the control numbers for my fitting (very much like a science experiment). After I hit my first six of the fitting, my technician went over the numbers with me. He explained the important numbers, showed me the less important numbers, and keyed on what we were looking for. He was very knowledgeable about the stats that the Trackman spit out, and made it easy for me to understand what the numbers meant and how it affected my golf ball. Now the REAL fitting began. After my control shots were done and in the books, we got to move on to testing the 100’s of combinations of clubs and shafts that Club Champion has to offer. This is where the real experience comes in. Anyone with a Trackman can give you the numbers from each shot you hit, they might even be knowledgeable on what changes you can make to improve your trouble areas. 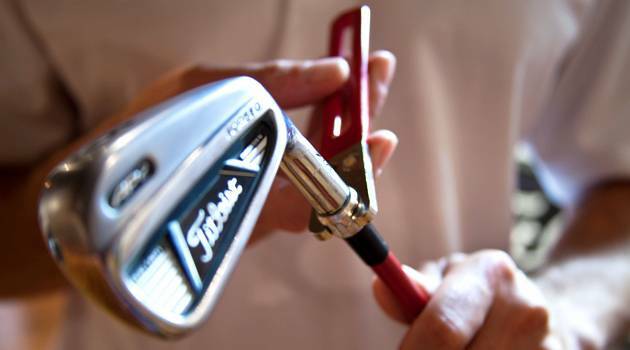 So why Club Champion over another club fitter? Club Champion not only has the top of the line swing analysis equipment, and the knowledge to make suggestions on what will improve your golfing trouble areas, but they actually have the technology and the demo clubs to suggest a shaft/head combination and let you try it right there on the spot. This is what I wanted. To test some different head and shaft combos that I would not get to try anywhere else. I can put a KBS shaft in a Titleist head, and then try a Taylormade head with the same shaft and compare the results. Then we switched up the shafts and tried some Mizuno heads. There are no other places you can go and try so many different head and shaft combinations, do it on a golf simulator that spits out so much information, and have a trained golf technician there to explain the difference in the numbers. Needless to say after several different head and shaft combinations, and going over the different qualities of each head/shaft, I had a lot to think about. My trouble was I could not attain the same numbers I was getting out of my current clubs. We tried many different combinations to try and move the needle, but no matter what we tried we could not keep my ball speed up and lower the spin rate. The technician explained to me (and forgive me if I mess this up) that I had a pretty high spin rate. Spin rate will affect how much the ball is going to launch up into the air (think of a shot that balloons up into the air and is losing distance by launching too high into the air). Too much spin will also make your hook or slice worse because the ball is spinning faster. Every head and shaft combo we tried was aimed at getting the spin rate down on my golf ball, but keep the other key metrics the same. This was a difficult task and we could not find a ton of room for improvement on my current set. After hitting balls on the simulator I was ready to move on to the next phase of my fitting…the putter. Everyone who has played with me knows that I have a solid game all around, and while I am not a bad putter (there are a few folks laughing out there) I am no where near a great putter. Mike and I got the SAM Putt Lab equipment rigged up to my current belly putter and I hit a few putts. What I found out surprised me. I have an outside to in swing path and the putter closes after impact. The putter head “releasing” or closing through the shot was promising and desirable, but pair that with my outside to in swing path and you got your self one giant case of the hooks when putting. My putts were starting left and moved left, a bad combination (unless you aim way right). Mike gave me a few swing thoughts: square up your feet to the target line (I had an open stance which promoted the outside to in swing path) and to grip the putter further down the shaft to allow my arms to hang freely from my body (this would decrease the amount my putter released through impact). Mike and I also discussed the benefits and disadvantages of my putter in relation to my putting stroke. I am currently using a Scotty Cameron Newport Mid Belly Putter 46 inches in length. The Newport Mid has a 45* toe hang, which promotes the putter head releasing through impact. In order for me to decrease the closing of the face through impact I would be better suited with a face balanced putter, which would mean a new putter. We also added about 30 grams of weight to the head, to allow me to feel the putter a bit better on the back swing. I preferred the heavier putter and liked the feel of the head with the additional weight. My fitting for my irons and putter lasted roughly two hours, and we still had the driver fitting to get to. I was going to be late for work, and my back was ready to give out, and therefore I had to decline getting fit for a driver (I was very disappointed). When I was collecting my things Mike started filling out my recommendation for my clubs. The heads I am currently using seemed to give me the best overall stats, but he recommended I put in a a spin lowering shaft like the KBS C Taper shaft (a shaft specifically designed to reduce ball spin). He also recommended that I cut my putter down in length to allow my arms to hang more freely and to eliminate some of the putter head rotation. As well as adding more weight to the head to allow for a better feel in the head, and to straighten out my swing path. Everything that Club Champion fit me for was logical and made sense. We did try out all the upgrades to my clubs, and there was statistical data that supported the fitting recommendations. Not only did Mike give me very sound advice, he answered all of my questions with very informative answers but never lost me with technical mumbo jumbo. Whether your a 3 HDCP looking to get closer to a scratch player, or an 18 HDCP looking to break 90 consistently, I would recommend Club Champion to any of my golfing buddies who are serious about their games and want to get every inch out of their clubs and current swings. Club Champion is a pioneer in the club fitting business, and the residents of Chicago are lucky to have such a great golf company headquartered so close to home. They’ve actually got three Chicagoland locations. The Chicago/River North store I visited, one in Northfield (North burbs) and one in Willowbrook (Southwest burbs). 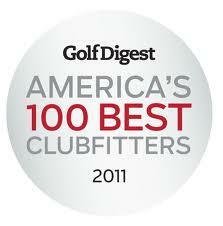 Oh yeah I forgot to mention that they were rated in the TOP 100 Club Fitters last year by Golf Digest. I really enjoyed my time at Club Champion. I learned a lot about my own golf game, how to improve it with some equipment changes, and the ins and outs of my current equipment. I give Club Champion a BIRDIE rating. The club fitting information is solid, and it is backed up statistically with data that proves your game can improve from the recommended changes in your current golf clubs. I would recommend serious golfers go to Club Champion and get their clubs fit. The only disadvantages I pulled away from Club Champion is the price, the physical strain, and the commitment of the golfer. The full bag fitting is $350, and is typically a 3-4 hour process. The cost is for the full bag fitting itself. After the fitting you can purchase the new clubs and shaft combos from Club Champion. At this point the club technicians at Club Champion can create the perfect set for you, fully custom to your specs including loft and lie adjustments, which is proven during your club fitting to improve your golf game. Club Champion can fit the average guy like a tour pro, but getting fit like a tour pro includes a hefty price. While my mental game was strong for my entire fitting my body was not as cooperative. The fitting takes an estimated three and a half hours. I was unable to do the entire fitting because my back would not allow me to hit balls for that amount of time (plus I had to get to work). I would recommend that you split up your fitting into two or even three sessions (which Club Champion offers). This way your body is at its peak for each and every portion of your club fitting experience and your numbers might be more consistent. If you are a serious golfer willing to commit to changing your golf clubs to better suit your swing and arguably improve your overall golf game, and you are willing to cough up the dough to get fit like a tour pro… Club Champion is the only place to go. Club Champion does not use any guess work, all of their changes are based on statistical data and no matter what you believe you cannot argue with science. Next Special Holiday Discount from Club Champion!